This medium-sized china cabinet is perfect for a mission style dining room. 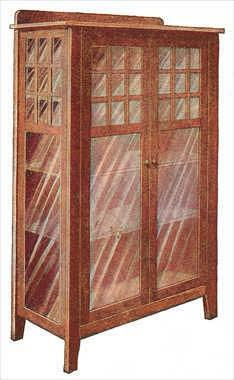 Click here for detailed china cabinet plans. 1 top, 1 by 19 by 38 in., S-1-S.
4 posts, 3/4 by 3 by 59 in., S-2-S.
4 side rails, 3/4 by 3 by 31 in., S-1-S.
4 end uprights, 1 by 2 by 48-1/2 in., S-2-S.
4 end rails, 1 by 3 by 16 in., S-2-S.
2 lattice rails, 1 by 2 by 13 in., S-2-S.
1 top board, 3/4 by 3 by 36 in., S-1-S.
4 side door rails, 3/4 by 2 by 47 in., S-2-S.
6 cross rails, 3/4 by 2 by 12 in., S-2-S.
4 slats, 1/2 by 3/4 by 16-1/2 in., S-2-S.
4 slats, 1/2 by 3/4 by 13-1/2 in., S-2-S.
8 slats, 1/2 by 3/4 by 12-1/2 in., S-2-S.
4 shelves, 5/8 by 16 by 32 in., S-1-S., poplar. 4 cleats, 1 in. sq. by 55 in., soft wood. 4 cleats, 1 in. sq. by 28 in., soft wood. 4 cleats, 1 in. sq. by 14 in., soft wood. Having this material on hand, start with the four posts, as they are all alike. Clamp them together, being careful to have them of the right length, and the ends square. Trim the bottom, as shown in the detail drawing, and then lay out the mortises for the front and back rails. These rails can now be laid out and the tenons cut to fit the mortises in the posts. The back rails should, in addition, be rabbeted for the back board as shown. The end rails are fastened to the posts by means of screws through 1-in. square cleats, fastened on the inside of the posts as shown in the section A-A. In all cases the screws should be run through the cleats into the framing so the heads will not show. The end rails should be rabbeted on the inside for the latticework and the glass. The back board should have the corners rounded as shown and be fastened to the top board with screws through from the bottom side. The top board is then fastened to the top rail cleats in the same manner. 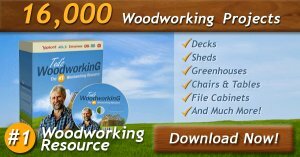 The doors are put together by means of tenons and mortises. The frames should be rabbeted on the inside for the latticework and the glass. Leaded glass can be used in place of this latticework, if it is desired. Suitable hinges and a catch should be supplied. These can be purchased at any hardware store. The shelves should be cut out at the corners to fit around the cleats. They rest on small blocks which are fastened to the cleats, or if desired, small holes can be drilled and pins used instead. The back is put on in the usual manner. A mirror can be put in without much trouble if it is desired. When putting the frame together, glue should be used on the joints, as it makes them much stiffer. Be careful to get the frame together perfectly square, or it will be hard to fit the doors and the glass. When it is complete, go over the whole carefully with fine sandpaper and remove all rough spots. Scrape all the surplus glue from about the joints, as stain will not take when there is any glue. The china cabinet can be finished in any one of the many mission stains.